The front page article of this week's Maidenhead Advertiser tells of a guilty verdict, being reached in court, following a local murder. 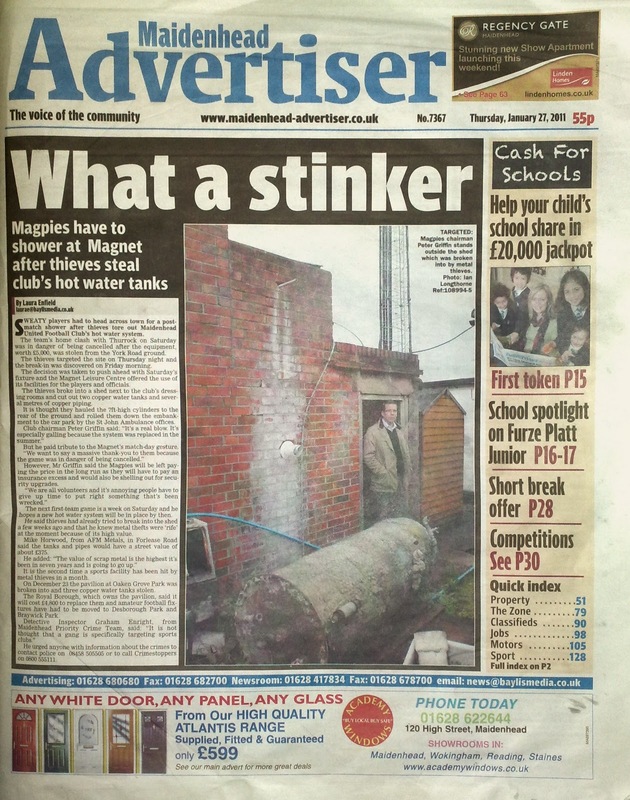 Two weeks ago, the subject matter was rather more trivial: the theft of the water boiler at York Road (also reported on the BBC, with comments from our very own Stevie G). “We are all volunteers” is one of the quotes attributed to Peter Griffin in the above article. Obviously MUFC Ltd – always keen to point out how professional they are when the situation suits (e.g. multi-year contracts to the manager, no supporters on the team coach etc., etc.) - were now playing the ‘poor little Maidenhead’ card. Except that I’m not sure the article gave a particularly good impression of the club. 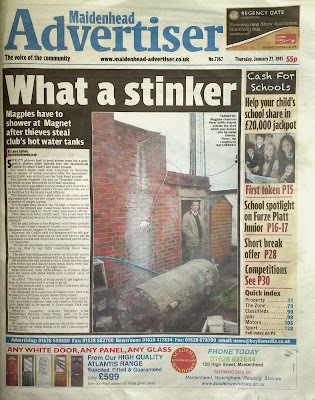 When I first picked up a copy of the paper - in Windsor library, as it happens - I didn’t realise initially that the front page story concerned MUFC Ltd; the headline (‘What a stinker’, as shown above) and the accompanying photo (showing the Chairman standing amongst weeds, badly stained brickwork, rusted machinery, and with various bits of concrete and piping lying about) lead me - genuinely - to think it was instead an article highlighting a local resident’s complaint about the council allowing a public convenience to lapse into a state of such disrepair that it had attracted junkies and other delinquents. Or something similar. Why then, did we not make upgrades to our security after the first attempted break in, especially in light of a similar incident at Oaken Grove before Christmas? Thefts from York Road? Wouldn't have happened on Trevor Kingham's watch! In all seriousness, obviously it’s terrible that the club have fallen victim to a crime - which, before someone suggests otherwise, I do not condone - but isn’t all this talk about potential lost revenue, the cost of a replacement tank, and higher insurance premiums, a bit of a sob story? The public of Maidenhead were supposed to feel sorry for us - and to a certain extent they should - yet most will do so without being aware that the manager is driving around in a company car, we have previously spent five-figure sums getting our accounts signed off, and that the expected cost (£5K) of a replacement boiler probably equates (give or take) to the weekly playing budget.